Lovely Mountain Lakefront Vacation Home with Wonderful Views! This is wonderful! I'm so glad we came! That's how you'll feel when you drive up to this fantastic, beautifully decorated mountain getaway on Lake Blue Ridge in the North Georgia Mountains. Walk through the front door through the slate floor entrance, step inside the great room with vaulted pine ceilings and drop ceiling fans. Gaze around the large gathering room with Tennessee Fieldstone dry stacked fireplace, cozy seating, farm-style dining table and chairs for six to eight, game tables, and large fully-equipped kitchen with serving bar. Two wide sliding glass doors frame a breathtaking view of the lake. 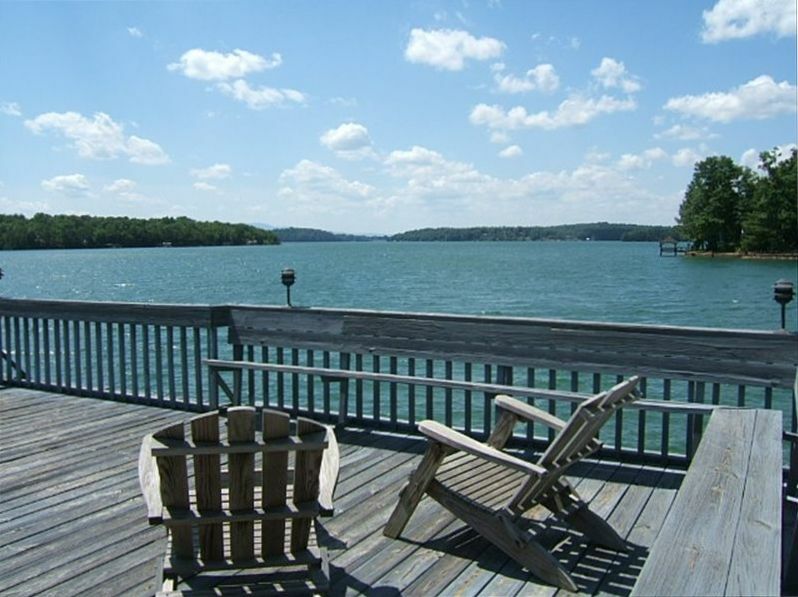 Step out on the generous Kentucky wrap-around deck, feel the mountain breezes, and drink in the expansive view of Lake Blue Ridge from this terrific vacation spot. Sip some iced tea while rocking on the porch or relaxing in the hammock. Enjoy mealtimes outside as well with seating for 12 or more. Returning inside, the two downstairs bedrooms, one with king bed the other with two twin beds, have sliding doors accessing the expansive porch overlooking the lake. Both share a generous bathroom. Upstairs you will find the master suite with King bed and lots of floor space. The master bath boasts a generous Jacuzzi tub ample enough for two, two vanity sinks, shower, and private toilet behind louver doors. Just off the Master is a cozy bunk bed room with a trundle sleeping three. From the porch, a paved walkway takes you to the water's edge to the two-story dock with tie downs for boats and sun deck on the upside. * Sleeps 9 in four bedrooms. Two king beds, two twins, two bunks with trundle, sleeps one in great room on the sofa. * Two Bathrooms, master with Jacuzzi. * Great Room with dry stack Tennessee Fieldstone fireplace, satellite TV, Foozball and mini-pool table, pine floors. * Generous wrap-around porch with five rocking chairs and hammock, beautiful views of the lake. * Large fully-equipped kitchen with dishwasher, microwave. * Outdoor gas grill, porch dining tables seating up to 12. Hi there. Our names are Bill and Jan McKay from Dalton, GA. We have been married for 42 years and are parents of 3 grown children and one grandchild so far. Countless memories with friends and family have been made at our very special vacation home on the lake. Hope you will make some of your own at this wonderful place as well. We bought this house while it was under construction. The layout was perfect with a massive porch and open interior great for entertaining lots of people. Loved the westward orentation and vast shoreline. We made an offer the first day we laid eyes on it! The house has a relaxed feel. Many of the interior furnishings are hand made and one of a kind. I used a woodsy but fresh color palate and chose accents that would withstand design trends much unlike other lake homes I see. 2 bath, 1 powder room. Westward view of the lake with fantastic sunsets over the water right in your back yard. rocking chairs, porch swing, Pawley's Island king size hammock, also sundeck with adirondack chair seating. Only one step to access the house. Central Heat and Air, Fully Equipped Kitchen, Extra Capacity Washer & Dryer, Gas Grill, Wrap Around Porch with several Rockers, Sun Deck with Adirondack seating, Hammock, Porch Dining, Bed linens provided, BRING YOUR OWN TOWELS! fishing & wildlife viewing, Pontoon Boat Rentals at Local Marina, Shopping & dining in Downtown Blue Ridge is a nostalgic experience, Lots of antique stores, art & gift shops, carriage rides on special weekends, train rides to nearby McCaysville & fun places to grab a bite or dine, Apple houses are nearby Fall is high season for apples.